A smallish modern art gallery in Montenegro's capital Podgorica that earns its additional appeal to dark tourists because it also houses an exhibition of presents once given to Tito, including ones from some leading "axis of evil" countries. What there is to see: the main attraction to the dark tourist, the exhibition of gifts to Tito, is upstairs on the second floor, under the roof. You may want to head there first. If you can't find it, ask the museum's attendant. When I was there (late April 2011), a very helpful man not only directed me to the right stairs to take but also came along to point out a few of the "star pieces" among the gifts selection. There's a whole set of gifts from North Korea, including a vase and some embroidery in typical DPRK kitsch style, but also a more realistic image showing the Juche Tower in Pyongyang (which will be immediately familiar to you if you've ever been to that city). From Iraq there's a small sculpture of a golden palm tree in a glass display case. This was given to Tito by Iraq's infamous former dictator Saddam Hussein, who Tito apparently visited several times. Boo! ... but then again, so did Western big shots such as the USA's Donald Rumsfeld. Though I assume that the latter would be less keen on a public display of any gifts he may have received on those envoy missions to Baghdad before Saddam fell from US grace in the early 1990s and was later deposed by the US when Rummy was Defence Secretary. Saddam Hussein had been a strong supporter of Tito's Yugoslav way from the 1960s onwards, and Yugoslavia had supplied lots of military and construction aid to Iraq. 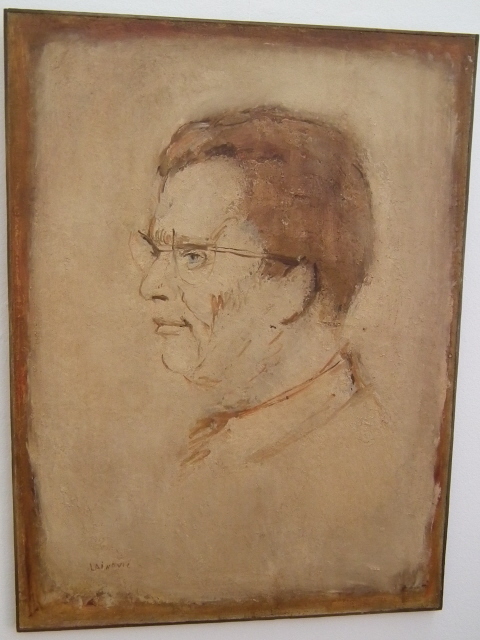 Tito last visited Iraq in 1979, the year before his death. On which occasion he was given the golden palm tree present was not disclosed in the exhibition. From another "bad boy" on the world dictatorial stage there's a camel saddle – and yes, it's from Libya's Colonel Gaddafi – see also the gifts exhibition for Bulgaria's Todor Zhivkov, who was also given such a saddle. Again you have to wonder: and what about the camel(s)? Anyway, Gaddafi was another one that Tito enjoyed especially good relations with in the framework of the non-aligned states … and this still has repercussions today, where more support for Gaddafi survived in some ex-Yugoslav countries (especially Serbia) than most other parts of the world even as the wacky dictator was headed for his final fate in Lybia's "revolution" of 2011. The remainder of the gifts are less spectacular, or less filled with dark allure, but overall I'd say that this gallery in Podgorica still sports a better selection of such gifts than the Tito Mausoleum and Museum in Belgrade! Needless to say, though, neither are even anywhere close to North Korea's fantastically OTT "International Friendship Exhibition" of millions of gifts to the deified Kims. The two floors below the gifts exhibition live up more to the designation of the gallery as the "contemporary art centre of Montenegro" ("Centar savremene umjetnosti Crne Gore" in Montenegrin). On the other hand you'd expect less appeal to the dedicated dark tourist here. But you might be surprised. As I found, some of the pieces on display had a decidedly dark bent to them. Take, for instance, the three hanged men in a painting from Bolivia, or the various screaming faces. The very starkest darkest item, however, was a sculpture that looked like it had jumped straight out of John Carpenter's "The Thing" or out of "Alien" or something. It's a deformed "man", his face screaming too, who is stumbling along on a heap of bones, brains, intestines and yet more screaming heads. It's by the Montenegrin artist Zlatko Glamocak and entitled (bizarrely) "Mala nocna muzika" ('a little night music'). In the rest of the exhibition there are also a number of pieces that are of a much less dark appeal but are still noteworthy in themselves, at least for those who have an eye for modern art. What I cannot say, however, is whether the exhibition I saw (in late April 2011) is a permanent one or whether it changes regularly (at least in part). As a dark tourism attraction, this modern art gallery may not play in the top league, but it's still a particular little gem and a must-see when passing through Podgorica. Location: on a hill to the west of Podgorica city centre, ca. 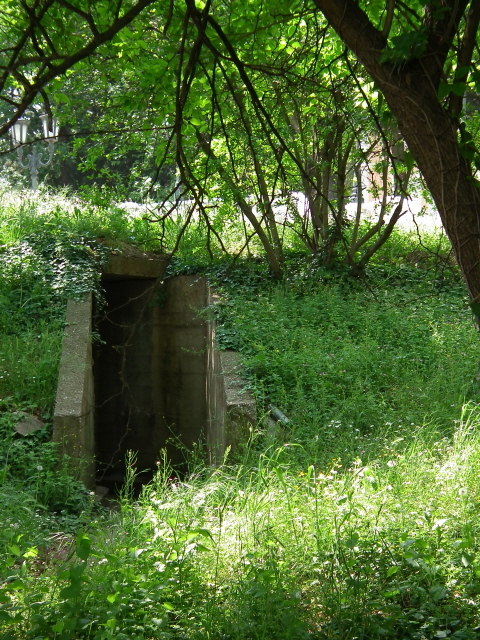 0.7 miles (1.1 km) from Republic Square, between Bulevar Revolucije, Ljubljanska and the US embassy by the Moraca river. Access and costs: just a short walk from the centre; free. Details: From central Podgorica first walk up Bulevar Sv Petra Cetinjskog westwards and cross the Blaza Jovanovica bridge over the Moraca river. Then turn left and walk past the somewhat weird building to your left, which is the Hotel Podgorica. Continue past the car park passing a swimming stadium to your right and the Moraca sports centre to your left. Past this, cross the roads at the intersection of Bulevar Revolucije and Ivana Milutinovica. Opposite is the grand US embassy (which was a construction site when I was there in April 2011 – obviously undergoing massive extensions). Leave this to your left, walking briefly up Bulevar Revolucije, then turn left into Djecja Street leading into the park behind the embassy complex. This will take you to the bottom of a set of baroque stairs leading up to the back of the gallery building. The entrance is on the other side. Opening hours: 8 a.m. to 8 p.m. in the week, Saturdays 10 a.m. to 2 p.m.; closed Sundays. Time required: this depends very much on your interest in art in general … and how you relate to modern art in particular. If you have a real taste for contemporary art you may spend up to an hour here, but with only a passing interest in modern art less than half an hour may do. The gifts section alone will be unlikely to take more than 10-15 minutes. 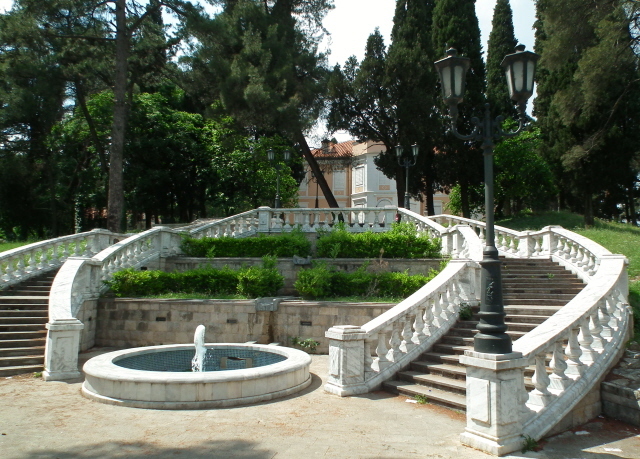 Combinations with other dark destinations: see Podgorica. Combinations with non-dark destinations: in general see under Podgorica – obviously, the rest of the art gallery's contents are worth a look too. 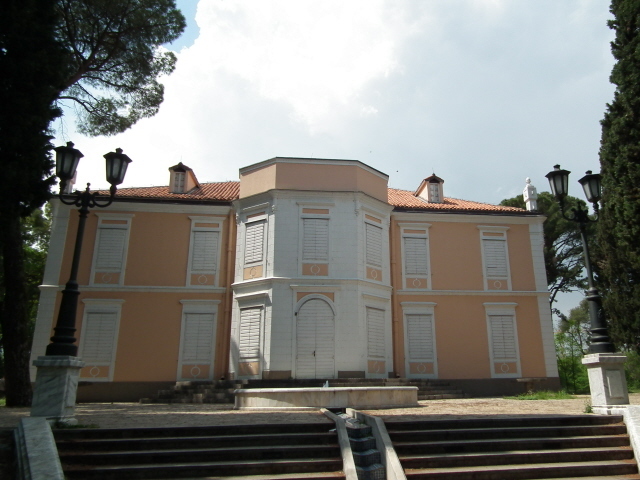 The building that the gallery is housed in is quite remarkable too, at least by Podgorica standards: it's one of the very few structures in the city that isn't of the brutalist-modernist, poured-concrete or prefab variety, but a classic little palace, which once belonged to King Nikola Montenegro's only such monarch – during the brief period as an independent kingdom between 1910 and WW1. Its cream and pink facade wouldn't stand out so much in other places, but here in Podgorica it's an exceptional gem. 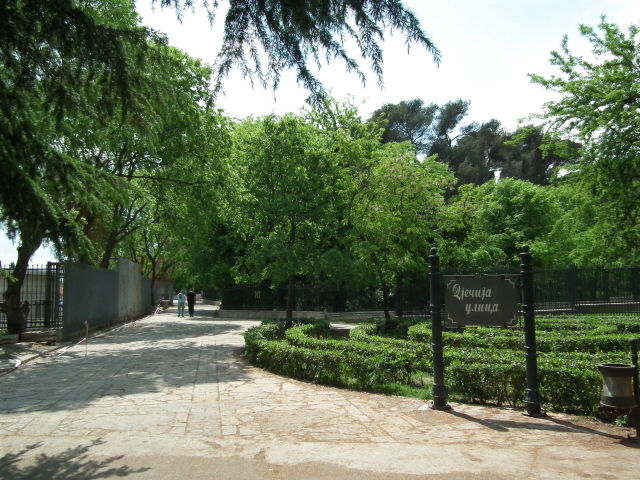 The park area around it is also quite pleasant.